I was in "hansei" mode, regretting my terrible mistake during Saori-san's stage, so was determined to come out swinging hard for my own stage! Considering how loud and ominous the sound check was, the sound during the gig was actually great and I could feel we had a lot of power and were clicking great. The one song I didn't do so great on was the Jazztronik "Tiger Eyes" but otherwise everything was really jelling, especially the new songs we were performing for this tour, "Genetic Imprints" and "One." Yamada sat in with us for the last couple tunes, "Genetic Imprints" and "You Make Me," and he kicked it HARD on "Genetic Imprints"!! It was a lot of fun for me to see my new songs come alive. Nyoro was ecstatic, said my voice was in great shape and that Suzuki-san especially sounded stronger than the day before. He changed his axe from a classical nylon string to a jazz acoustic with metallic strings which worked especially well when the bass came into the picture. It was good to see some familiar faces in the audience, as sparse as the attendance was, and I was surprised to see Kyoko Takami and Cece -- they really did come like they said! I was a little embarrassed to talk to them afterwards, not quite sure what to say. I'm a little shy like. When I got back to the hotel, I knew I would have the next few days off so treated myself to the chocolates they gave out at the Swarovski event -- I ate the whole box! Wow, I don't think I've had jetlag this bad in a while. Can't seem to get more than 4-5 hours of sleep and it's starting to get on my nerves...literally. I had 3 days off in Tokyo which was really nice although I can't say I did much use of my time other than see friends, have a few meetings, read a book ("Buddha: A Story of Enlightenment" by Deepak Chopra) and going to the Pokemon Center to score some stuff for my little guy -- can't come home empty handed. I rented out a studio a couple days to practice so I can keep my chops in shape. The highlight was dinner at Yuki's where his mother, who has terminal stage 4 lung cancer, cooked a ridiculous meal that included shark fin soup -- wow! Sasha called during the meal, pissed that I hadn't called him yet and panicking because Nikita had come down with fever. Yuki fortunately calmed him down and by the time I got back to the hotel to call him back, he was in a more reasonable state of mind. Yesterday was a gig at a small club in Ueda, Nagano, this time a duet with Higuchi-san. It's been nearly a year since I played with him; he has a completely different style from Suzuki-san, a little folkier, so it brings out a different element. We did two sets so that they could change audiences as the club only can host 40-50 people. For the first set, everyone was sitting and was a more mature crowd like ones I see at the Blue Note; the second set was a younger club audience with the token singular guy who has a voice that cuts through the entire room as he tries to get everyone worked up -- I personally like people like this, they're a lot of fun. The people there were so sweet and had great listening ears. I really had a wonderful time, but for some reason my voice wasn't so great -- probably from all the lack of sleep and drinking too much the night before. Speaking of the night before, it was April Fools night, and Nyoro and I met up to go to our good friend Yuko-san's restaurant, Kitchen 5, where Nyoro dropped the news that she was pregnant! She had been telling me since my arrival that she couldn't understand why she couldn't drop her post pregnancy weight from their last baby (just born last June), and had even taken a home pregnancy test which came out negative. That day she went to the doctor's to check and make sure she didn't have some weird womb affliction where lo and behold! they discovered that she's 4-1/2 months along! Crazy. Crazier yet is that the delivery date is estimated to be on my birth date, August 19! Yuko-san opened up a special bottle of champagne for us (where I kept a hawk eye over Nyoro to make sure she didn't drink too much!) 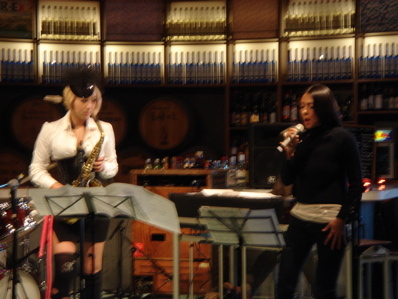 and I went on to Body & Soul jazz club to pay respects to owner Kyoko-san where I continued my inner celebration of Nyoro's pregnancy with another glass of wine. The next morning, in a hung over whooze, I suddenly had the feeling that maybe Nyoro was pulling one over on me as an April Fool's joke, but she really is pregnant and even showed me the sonogram when she came to pick me up to go to Nagano! Fortunately I was able to get some wink eye on the shinkansen ride over from Nagano to Osaka which helped a lot, otherwise I think I would be in danger of losing my voice from fatigue. Today I performed in a club called Triangle, my first time there -- a duet with Suzuki-san. The story is that they didn't have enough bread to pay our fee but because the performance time was at 8pm, I felt uncomfortable with the idea of doing a PA for an hour -- that would be a nightmare. Can you believe Suzuki-san offered to come and do the gig for free?! Unbelievable. So Nyoro gave her shinkasen ticket to Suzuki-san. Now, that's like beyond dedication and support; I'm truly humbled. Nice promoter/club manager, but somehow either it wasn't promoted properly or I'm just losing my chops with the audience here. I think there were like 40-50 people in the audience, really sparse. Still, Suzuki-san and I performed I thought really well and with a lot of heart, and the audience seemed to really enjoy themselves; it was a great vibe. Afterwards the sound man said he had goose pimples and that it was one of the best performances he'd witnessed in a long time, nice to hear.